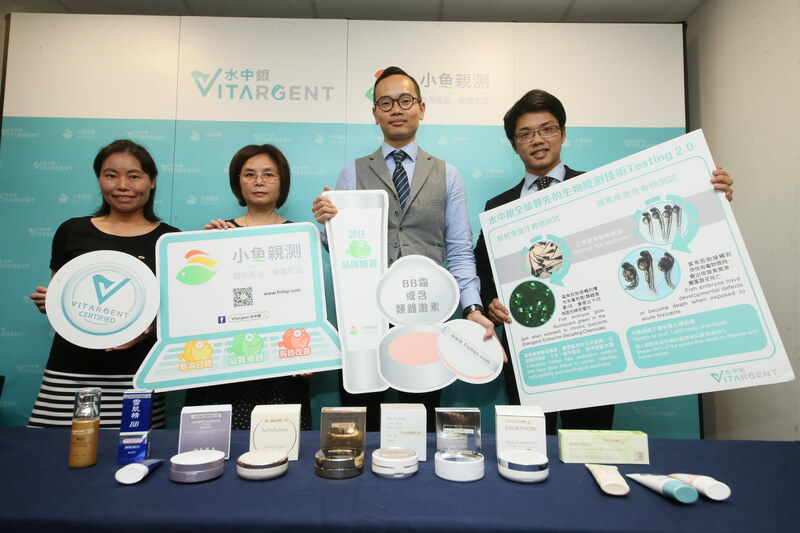 (Hong Kong, May 23rd, 2017) Vitargent (International) Biotechnology Limited known for applying its proprietary “Transgenic Medaka” and “Zebrafish Fish” Embryo Toxicity (FET) testing technology (Testing 2.0) on food and skincare products, introduces the world’s first consumer product safety information platform, Test-it™(www.fishqc.com). The platform proceeds to testing cosmetic products following last month’s publication on edible oil. Test-it uses Testing 2.0 biological testing technology to examine consumer product safety and has published the results of the inaugural test project on 43 best selling BB Cream and BB Cushion products in the market. Test results put 24 types in the Green Fish category, denoting the products are excellent in terms of safety; 1 in the Yellow Fish category, indicating their safety level is basic, and 18 are categorized as Red Fish, with safety at sub-optimal standards. Test results show high concentration of estrogen in world renowned brands with toxicity level equivalent to a contraceptive pill. Test results also show that samples with higher SPF level have a lower passing rate in the safety screening test. Consumers are recommended to purchase with extra caution. A growing popularity of BB Cream products in Hong Kong has emerged from the Japanese and Korean beauty trending. The multifunctional product encompasses properties of an all-in-one foundation, concealer, moisturizer, primer and SPF power. However, consumers often overlooked the chemical toxicants in the additional functions of the products. causing skin allergies such as rashes and pruritus. From 2016 to 2017Test-it™ sampled 43 BB Cream and BB Cushion products from 32 different brands. The samples purchased from supermarkets, chain stores and online stores as a consumer including world renowned brands YvesSaintLaurent, M.A.C, Dior, Innisfree, SKII, Laneige, Shisheido, Sekkisei and Sulwhasoo. Vitargent’s Chief Executive Officer Jimmy Tao said: “Vitargent applies fish embryo Testing 2.0 technology to conduct toxicity screening on the BB Cream samples. Test results put products into three categories: Green Fish-Yellow Fish-Red Fish, published onto consumer product safety information platform, Test-it™to provide product safety references for consumers. Biological test is proven to have a capacity to screen over 1,000 toxicants in 48 hours, covering harmful substances missing in the existing regulatory standard. Test-it™ benchmarks against the international product safety standards of the European Union (EU), the World Health Organization (WHO) and the Organization for Economic Co-operation and Development (OECD), as well as the national safety standards of the US, Japan and China. Horizontal analyses against similar products are also conducted. Green Fish means “Excellence” in safety, indicating good performance under screening of acute toxicity, chronic toxicity and banned ingredients. Consumers can rest assured that the products are safe for purchase. Yellow Fish means “Basic” in safety, meaning a product meets the safety baselines in the screening of acute and chronic toxicity and banned ingredients. Consumers are recommended to purchase with caution. Red Fish means “Sub-Optimal” in safety, indicating a product is below standard in one or more criteria in the screening of acute and chronic toxicity and banned ingredients. Consumers are recommended to purchase with extra caution. Vitargent tested 43 BB Creams samples. The test showed that 24 samples are categorized as Green Fish(Excellence), while 1 sample is Yellow Fish(Basic) and 18 are Red Fish(Sub-Optimal). The median price of the 43 samples is HK$9.0 per gram. The cheapest BB Cream costs HKD$1.9 per gram while the most expensive BB Cream costs 18 times more at HKD $34.3 per gram. Of the 40 brands priced at below $3.6 per gram, 4 are categorized Green Fish(29%), 1 Yellow Fish(7%) and 9 Red Fish(64%). Of the 31 samples in the price range of $3.6-$9.5 per gram, 13 are categorized Green Fish(87%), 2 Red Fish(13%). Among the samples priced above HK$9.5 per gram, 7 are categorized Green Fish(50%), 7 are categorized Red Fish(50%). The test results show that most cheap BB Cream are unsafe. Consumers are recommended to purchase with extra caution. Expensive BB Cream show a mixed result, luxurious brand does not represent safety. Median priced BB Cream show the most favorable result in this screening. By production origin, BB Creams made in Asia performed better. More than half of the tested products 15 (58%) are Green Fish, 1 (4%) is categorized Yellow Fish and 9(38%) are Red Fish. BB Cream made in Japan has a high rate of Green Fish (88%), as well as BB Cream made in Korea (80%). In the random sampling, a few world renowned BB Cream brand samples showed a high concentration of estrogen. One of these samples contain 8,400ng/g, containing a level of estrogen equivalent to a contraceptive pill ( 10,000ng/g). According to World Health Organization, estrogen may cause defects including cancers, infertility, neurological disorders, precocious puberty and diabetes. 42 out of the 43 BB Cream samples contains SPF function. Test results showed that 1 sample below SPF 15 is categorized as Green Fish ( 100%). In the samples with SPF15-SPF30, 13 are categorized as Green Fish(68%), 6 are categorized as Red Fish(32%). In the samples higher than SPF30, 10 are categorized as Green Fish(44%), 1 categorized Yellow Fish and 12 categorized as Red Fish(52%). 2 The burning Facts. available at https://drive.google.com/drive/u/1/folders/0B1_f96X6Yt9ARnJRZjBkZGs5SE0. 3 Schlump et al. Endocrine active UV filters: developmental toxicity and exposure through breast milk. Chimia 2008, 62: 345-351. 4 Barr et al. Measurement of paraben concentrations in human breast tissue at serial locations across the breast from axilla to sternum. J Appl Toxicol. 2012, 32(3):219-232. 5 Valle-Sistac et al. Determination of parabens and benzophenone-type UV filters in human plancenta. First description of the existence of bencyl paraben and benzophenone-4. Environ Int. 2016, 88: 243-249.